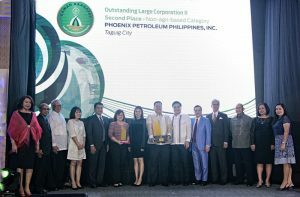 Phoenix Petroleum won second place as Outstanding Large Corporation II under the non-agri-based category in LANDBANK’s Gawad Kaagapay Awards 2017 held on August 14, 2017 at the Philippine International Convention Center in Pasay. The company was represented by Phoenix Petroleum Vice President for External Affairs, Business Development, and Security Atty. Raymond Zorrilla, Chelsea Shipping Vice President for Finance Igna Braga, and Phoenix Treasury Manager Karen Almacen. Land Bank of the Philippines recognized Phoenix Petroleum for its contribution to priority sectors like small and medium enterprises which promote countryside development. Nominees were judged using quantitative and qualitative parameters. The quantitative parameters were based on operations, sustainability, relationship with LANDBANK, and community supports/services, while the qualitative parameters were about performance, history, impact, and direction of the business. To determine this year’s winners, the panel of experts and judges from LANDBANK went around the country and performed stringent measures of validation. They visited Phoenix Petroleum’s terminal in Davao City, the company’s first depot. The Gawad Korporasyon KAagapay sa Ating GAnap na tagumPAY (GAWAD KAAGAPAY) was launched by the Land Bank of the Philippines as a fitting accolade for its clients who have been strong partners of the bank and have been providing their significant share in community development.